Mid-Continent Railway Museum has one of the largest restored wooden car fleets in North America and is continuing to obtain and restore additional wooden cars. Nowhere else is there anything like it, and its potential is tremendous. 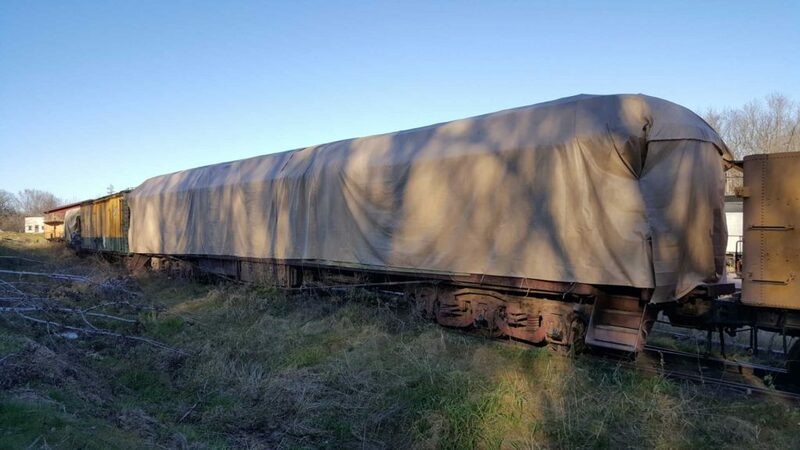 At the present time the restoration department is actively restoring two wooden passenger cars and has many more cars waiting to be restored. Of those cars waiting restoration, many are stored outside and subject to further deterioration by the elements. The Car Shop, where the restorations take place, has room for approximately 8 cars and is currently full. If you would see, or have seen, the wooden cars that have been restored by the member volunteers, you would agree that the restored cars are works of art. Currently once a wooden car is restored, there is no place to display or store the car. Mid-Continent has only one building on the property that is currently used for the display of restored cars, the Coach Shed, and that building is filled to capacity (13 cars). Three of the cars currently stored in the Car Shop are fully restored and take up room where other wooden cars could be stored pending restoration. It would be totally impractical to place a restored car outside, subject to the elements, especially a Wisconsin Winter, as the car would have to be restored again in just a few years. The only reasonable solution is to build an additional coach shed for displays. A shortage of indoor storage and display space leaves tarps and temporary coverings as the only means of providing a modicum of protection to many of Mid-Continent’s treasured collection items – obscuring them from public view in the process. In 2016, Mid-Continent received the final payment from a bequest from the estate of Laurence H. Dorcy totaling $968,046. The funds received from the Dorcy estate were restricted, but could be used to build “a structure for the restoration and storage of railroad cars.” The Board of Directors of Mid-Continent has approved the building of a new Coach Shed #2. At the present time, work has begun on the site development and grading phase of the building project. The next phase of the project is the construction of the Coach Shed and the building of track to the new Coach Shed. The total estimated cost of the project is $1,144,000. 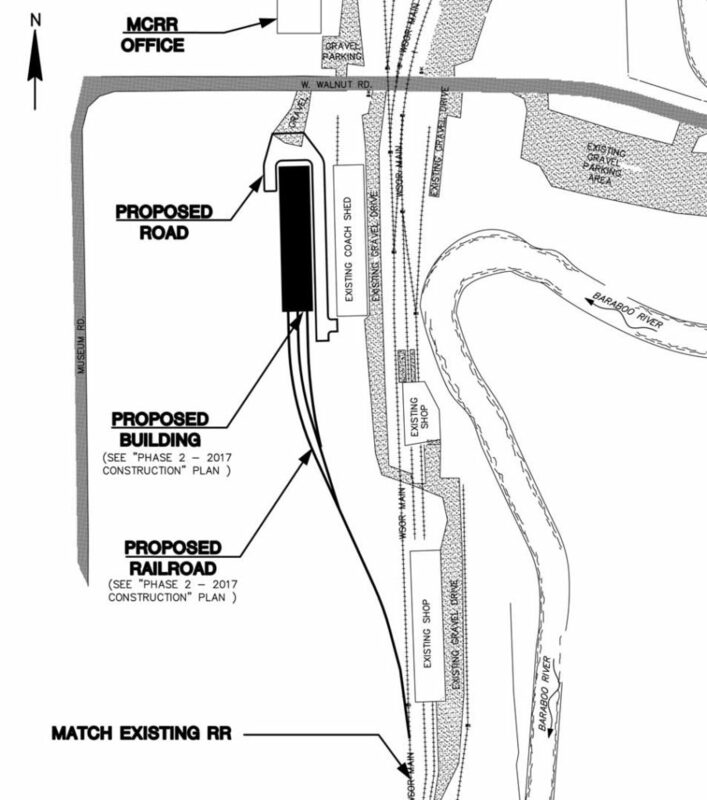 Proposed site plan for new display building. The mission of Mid-Continent is dedicated to preserving and interpreting the railroad legacy for the educational benefit of the general public. Its primary focus is on railroading of the Upper Midwest during the Golden Age of Railroading, 1884-1915. This is why we are turning to you now. Would you help preserve wooden railroad cars of a bygone era? Please consider making a contribution to Mid-Continent so that this worthwhile project can be completed. Our very large collection of wooden passenger cars dates from the Golden Age of Railroading (1884 to 1915). Several of the restored cars have received prestigious awards for their historically accurate and high quality restorations. These cars are gems, with the restored cars being diamonds and the cars awaiting restoration being diamonds in the rough. The wooden passenger car collection consists of (24) cars, built by (9) different car builder companies dating from 1864 to 1912. Nine of the wooden cars have been painstakingly restored, two are in the process of being restored and the balance of the cars are awaiting resources to restore the cars to their former beauty. Restoring a 100+ year old wooden car is no small undertaking as it can take some 10,000 man hours and anywhere from $150,000 to $1,200,000 depending on the level of volunteer labor. In the Car Shop the volunteers strip the wooden cars to their frame, replace any rotten or defective wood, and then rebuild the cars to their original glory, meticulously following the details that the original builders made when the car was originally built. The collection contains a full array of passenger cars including luxurious first class cars, business cars, coaches, combination car, a sleeping car, baggage and mail cars. In addition the collection includes the only original “fish” car that has been preserved and restored. This unique car was built for the Wisconsin Fish Commission in 1912 to stock fish (fingerlings) in streams and rivers throughout the state of Wisconsin. The collection also includes complete sets of passenger equipment from specific railroads such as the Soo Line, Lake Superior & Ishpeming, Copper Range and the Duluth South Shore & Atlantic. These sets of equipment add to the importance and significance of Mid-Continent’s wooden car collection. Presently only 50% of Mid-Continent’s wooden car collection is under cover with only 25% of them accessible for the public to view. This priceless collection is at significant risk due lack of appropriate enclosed exhibit space. The challenge now is to find the necessary resources to protect these gems from the harsh environmental conditions of Central Wisconsin. A new exhibit building is urgently needed to house Mid-Continent’s wooden passenger car collection, provide public access, provide additional exhibition space, and assure that these gems are preserved for future generations. We thank you for your consideration. Mid-Continent Railway Historical Society, Inc., a not-for-profit Wisconsin Corporation, is an outdoor living history museum and operating railroad, and is accredited by the Internal Revenue Service as a 501(c)(3) organization. All contributions to Mid-Continent are tax deductible.